Design & Development Associates Ltd are architectural designers for new builds, house extensions, loft conversions, barn conversions and house remodelling. The company offers full architectural design & building surveying services in Dorset & Hampshire. Design & Development Associates are a small, family run architectural company consisting of both Architectural Technologists (like architects, but an architectural designer with a speciality in construction techniques) and Building Surveyors. From initial ideas to planning applications and building regulation drawings, Design & Development Associates will work with you to ensure a building design that meets your needs and satisfies the Local Authority planning department. Design & Development Associates offer professional design advice for loft extensions in Poole, Bournemouth, Christchurch & surrounding areas. With a free initial consultation to discuss the best loft conversion design to match your requirements plus the likely build costs. It really is beneficial to get the loft conversion plans done by a professional architectural designer first as you can then send the plans to several contractors for price comparisons. House extensions offer extra living space & increase property value. They can be a much better option than moving home. Design & Development Associates offer a free consultation to advise on your house extension options. Instructing this local architectural design company allows optimum design knowing local council planning constraints, fast planning approval & also recommendations of local contractors to quote on the build once the house extension plans have been approved. Looking for an architect in Bournemouth or Poole area for your home development project? 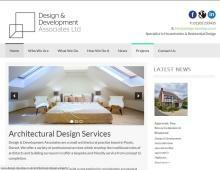 Contact an architectural designer at Design & Development Associates for a free no obligation consultation today.